Home → Health → Can Office Workers Stay in Shape? Can you work at an office 8 to 10 or even 12 hours a day and stay in shape? If you are a stationary worker, then you might be having a hard time managing your weight. But all you need is a gym membership and you’ll eventually get to your desired body composition, right? Well, if you have been down this road before, then you know it is not as simple as that. Okay, so let’s say that you are motivated to workout regularly but you are not entirely satisfied with your progress in the gym. You are not not happy with how you look and you are ashamed of how unimpressive your bench press is. Some days you probably eat way too much (and hate yourself after), other times you starve yourself. Your workout schedule is irregular and you are not tracking your lifts. In fact, you have no clear idea of what your fitness goals are. It is actually quite dramatic how easily you can fall out of shape once you forget about the basics. In fact, it can be quite depressing to stay “dedicated” to your physique and not see any progress at all one month after another. Especially when you are giving it all you’ve got in the gym. For starters, stop feeling sorry for yourself and take responsibility for the state you are in right now. You are the one responsible for what and how much you’ve been eating. 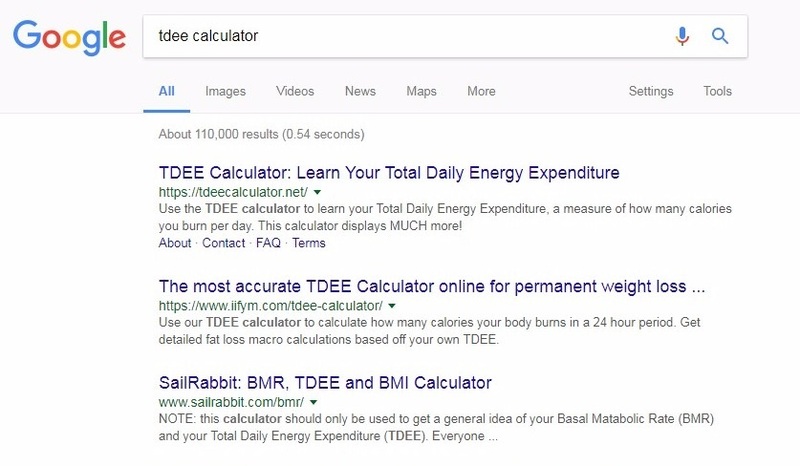 For starters, make a quick Google search for a TDEE calculator. TDEE stands for total daily energy expenditure. In other words, the amount of calories you burn in a day. Using such a tool won’t give you a perfect view of your required calories but it will come pretty close. Is your goal to build muscle? Then plan on adding about 400-500 additional calories on top of your TDEE. Is your goal to lose weight (fat)? Then plan on reducing those calories by about 500 a day. To give you an idea of what I am talking about, let’s take a look at my personal TDEE. Right now I need 2,900 calories to maintain my current weight. If I want to see noticeable results, then I will reduce my daily calorie intake to 2,400. In my experience, I will become significantly leaner in just two months. So you’ve picked a goal. Either going into a calorie surplus to gain weight or going into a calorie deficit to lose weight. Great, now you need to find a macro intake that works best for you. Wait, you know macros are, right? They are what make up calories. In other words, we can divide all food into 3 main groups of macronutrients which are proteins, carbohydrates, and fats. So, a gram of fat is 9 calories. A gram of carbohydrates is 4 calories. And a gram of protein is also 4 calories. Try to find a good ratio in order to get a decent amount of all 3 in your diet as you need all of them in order to survive. Don’t treat any of them like they are bad. For instance, fat and carbs get a lot of bad rep but you actually need them to sort of live. So, for instance, if I am having 2,900 calories a day, then I can split those into 35% from protein, 45% from carbs, and 20% from fat. Okay, right now you might be thinking that this is all getting kind of confusing. You didn’t expect this splitting, meandering logic. Things were supposed to be simple. And you are right, in the beginning it does seem this way. That is why you need a calorie and macro tracking application. Here’s a recommendation. Try MyFitnessPal. You can use it on either your phone or computer. You tell it your daily calories and macros, and then you just scan the barcode of each food you eat throughout the day. From there on, you just check the add and see where you are at and if you need to eat more or if you’ve reached your daily limit. This app can be a lifesaver if you are diligent enough to track everything you eat throughout the day. However, it is absolutely meaningless without the next step. Which is probably the most important one. Let’s repeat that – be consistent. This is where most people fail. None of the above is going to work unless you, yes you, stay on track with your fitness plan. I know, some days, you are going to be a little bit more unmotivated than others. And some days you might be scratching your head over if you are making any progress at all. There will come a time when you will feel sad and depressed and you’re going to search for solace in your favorite foods. That’s when you’ll have to remind yourself about your true goals. Remember that If you are following all of the steps above, then you are making progress. You just need to, let’s repeat that again, be consistent and keep going strong. You will never reach your true potential unless you dedicate yourself to your goal. #6. Wait, what about working out? Note how I’ve saved working out for the very end. That’s because for most folks training comes first and the rest is ignored. Do not allow yourself to fall into this category. This said, you want to find a good workout routine that works best for you and it is in alignment with your fitness goals. Progress pictures can be a great source of motivation. Especially after a month or two when you have noticeable changes in your body composition. This is going to boost your motivation tremendously to continue with your plan. Just remember that it cannot happen overnight and you have to give yourself at least two to three months to get there. But when you start to notice the big changes, this is going to inspire you and others. Oh, that’s right. All the colleagues at the office will notice that you’ve have changed. Okay, this is the end of our simple guide. Does it cover everything regarding nutrition and training? Absolutely not. However, it presents a simple starting point. The goal is to get you going so you won’t be stuck in that perpetual cycle of putting in the work without seeing the results.